Should Mark Scott Be Facing Impeachment? Mark Scott has remained steadfast in his bid for Mayor of Corpus Christi in 2018. The only thing that seemed to stand in his way was a little thing called the City Charter, the “constitution” of the City. With the help of local attorney, John Bell, Scott used a loophole created by poor wording in the section on term limits to overcome this obstacle. That, some believe, is not a problem since that’s the whole idea of a loophole. It’s like finding a secret passage out of a dark cave. Others, however, including several sitting Council members see it as Scott thumbing his nose at the spirit of the law and – worse – at the citizens who voted to pass it. But, does all of this provide enough fuel for the impeachment fire? To try to understand the issue from a historical perspective, the following Caller-Times stories on the topic of term limits for Council members might be helpful in allowing the average person to decide if Scott’s actions are legal and acceptable to the citizens or if they are sneaky and less than ethical. “Voters could decide to remove the city rule that allows City Council members who have reached their term limits to sit out two years and then run again. The change, which would force council members out after eight years, is one recommendation from a committee that reviewed the city’s charter. “The committee will hold a public hearing on that and other proposed changes at 5:30 p.m. Monday, Feb. 2, at City Hall. Committee chairman Bob White, who supports the term limit change, said long-serving council members have too much name recognition to get voted out and start wielding political power. “The committee split 4-3 on the term-limit issue, which committee member John Bell said was one of the most contentious decisions the group discussed during the nine months it has met. He doesn’t support the change. “Council members offered a compromise between the current term limit rule and what the committee suggested. The current rule allows people to serve four two-year terms as a council member or mayor, or six terms if they serve some terms as a council member and others as mayor. Those who reach term limits can run again after sitting out a two-year term. The committee wanted to ban people from running again after serving four terms. “Instead, council members said the cooling-off period should be six years. Scott said he thought voters last year proved that term limits weren’t necessary when they voted out an incumbent mayor. Scott wouldn’t have been eligible to run last year if the four-term lifetime term limit had been in place. “Corpus Christi voters approved six changes to the city charter, including one that will move City Council elections to November. “Voters approved that change, which was Proposition Six on the ballot, by 81 percent, according to complete, unofficial returns. “The election date referendum won’t change anything for current council members. It will create a shortened council term from May 2011 until November 2012. Future councils would be elected in November to two-year terms. “Voters also supported two propositions that clarify language in the city’s charter, adding a city auditor position, allowing the council to reprimand city judges and strengthening term limits. “The current term limits force a council member who has served four consecutive two-year terms to sit out at least one term. “The proposed rule would require a term-limited council member to sit out three terms, a total of six years, before running again. “The city’s charter is like a constitution for the city and sets local rules and policies. Any change requires the City Council to agree to put it on the ballot and voter approval. But, it seems that the language was either too specific or not specific enough because Mark Scott resigned his position three months shy of a full term in order to be eligible to run for mayor in 2018, thinking that it would render his current term null and void. It turns out that was true to some extent. What actually saved Scott was the fact that the switch from May to November elections created a situation whereby his term was shorter than the required full two years. Some Council members, who were aggravated by Scott’s attempt to circumvent the City Charter, requested the help of city attorney Miles Risley. Risley declined to render a decision on such a highly political matter, especially during the election season, and suggested that outside counsel be hired to sort through the evidence, something that Scott criticized as a waste of tax dollars. It might be important to note, that Scott, though he resigned his position, and therefore has not been attending Council meetings since he made his announcement in September, has continued to receive payment for serving on Council. All that aside, the City Council agreed and gave direction to hire Charles Zech to render an opinion. Charles Zech stated that Scott is still a council member unless a replacement was appointed and qualified, which did not happen. Zech also stated that the shortened term in 2011 does not count against term limits since it was a shortened term. 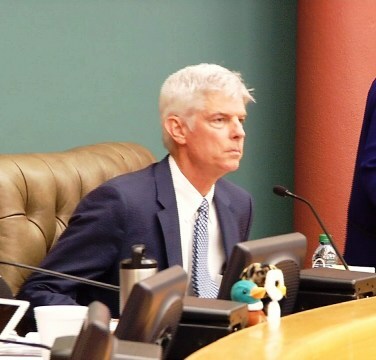 It appears that Scott, even though he was on Council when the change took place, must not have known that the term in question was already shortened, or he would not have been compelled to resign three months shy of the end of his term. This little tidbit may be more telling of the kind of council member Scott has been and the kind of mayor he could be. Council Member Carolyn Vaughn, who has been pushing for more accountability of City Council members and staff through a review of the Ethics Code, believes that Scott has broken the law, at least in spirit. “We know that he admitted that he was resigning so he could solely run for mayor. When he did that, he violated the spirit and the intent of the provision that was put in there. To me, the spirit and the intent is just as important as the letter of the law,” said Vaughn at the same October 25 meeting. According to USLegal.com, “Spirit of law refers to ideas that the creators of a particular law wanted to have effect. It is the intent and purpose of the lawmaker, or framer of the Constitution, as determined by a consideration of the whole context thereof. Spirit of law is determined from the letters and the circumstances surrounding its enactment.” This is perhaps the reason that White’s testimony was crucial to assisting the Council in making the decision to hire outside counsel. After much discussion about the Zech report, Vaughn referenced Article 2, Section 11.A.6 of the City Charter, which outlines the procedures for the removal of a Council member due to 3 consecutive absences. Mark Scott has now missed four meetings consecutively. Removal of a council member purposely missing 3 or more meetings and subverting the Charter may be the next move of the Council. 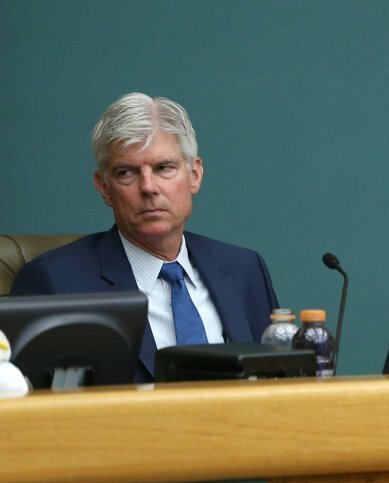 Councilwoman Colleen McIntyre accused the other Council members of taking action against Scott to prevent him from running in the 2018 mayoral election, something to which Council members Vaughn, Rubio, Garza, and Rosas took offense. McIntyre was not shaken as she continued to defend Scott’s actions, saying that the term limits system is convoluted, leading Scott to believe that he was legally doing what he needed to do to run for mayor. In all of this hashing and rehashing of events, at no time has Scott provided the public with the real reason he wants to be mayor and why he was willing to miss important meetings. In his absence, the Council voted on the City Budget, the Comprehensive Plan, Park Road 22, and wastewater plant consolidation. Many are asking how he could desert his post when the people who elected him expected him to be there to represent them. Does Scott really care about what the public thinks? He said he has faith in the public, but it seems the public may not have faith in him. This may not be the best way to start a campaign to run for Mayor of Corpus Christi. This prompted a discussion on the intent of the law. “We either have intent in the law or not,” Taubman explained. He went on to say that the more legislators write law in an attempt to clarify it that they actually create lots of opportunities for loopholes, like the one Scott used to try to resign so that he would not term out. “If you don’t have the intent of the law as the basis of your social understanding, you don’t have much. At the end of the day, intent and honor are all you have,” said Taubman. The Council met for several hours behind closed doors on November 1, 2016, to consider the possible disciplinary action and/or removal of City Council Member Mark Scott, pursuant to Article II, Section 11 of the Charter of the City of Corpus Christi. The City Council issued a reprimand to City Councilman Mark Scott for his attempt to avoid terming out by resigning to run for mayor. As a result, he will likely not be able to run for mayor in 2018 and must reimburse the city council for meetings missed since September. Furthermore, the Council passed a resolution that upheld the intent of the City Charter term limits amendment approved by voters in 2010 but said that the resolutions would not change the legal opinion of outside counsel that the shortened term would not count towards Scott’s term limits. “I respect the council as a body’s opinion. I don’t agree with it,” Scott said. Six citizens addressed the Council during public comment, each calling for Scott’s removal from the Council. Each gave similar reasons: dereliction of duty, three or more consecutive absences from Council meetings, and general lack of respect for the will of the people. A petition, signed by nine voters and submitted on Monday, calls for the removal of Scott and guarantees the Council will again address the City Charter and its provision on term limits. Impeachment is still a possibility, which would prevent Scott from making a bid for mayor in 2018. Scott will remain a council member until one of the at-large candidates currently running for office replaces him unless he is impeached, a discussion that may take place two weeks from now.